It’s not the most practical accessory for Dubai, but let me tell you these things get a lot of wear esp in air-conditioned locations. They don’t take a lot of yarn (up to 100 yards at most) and they knit up very quickly. I find that once you get your magic number (as in gauge), you can whip up anything from a simple stockinette version to a ribbed version and even a simple cabled version. 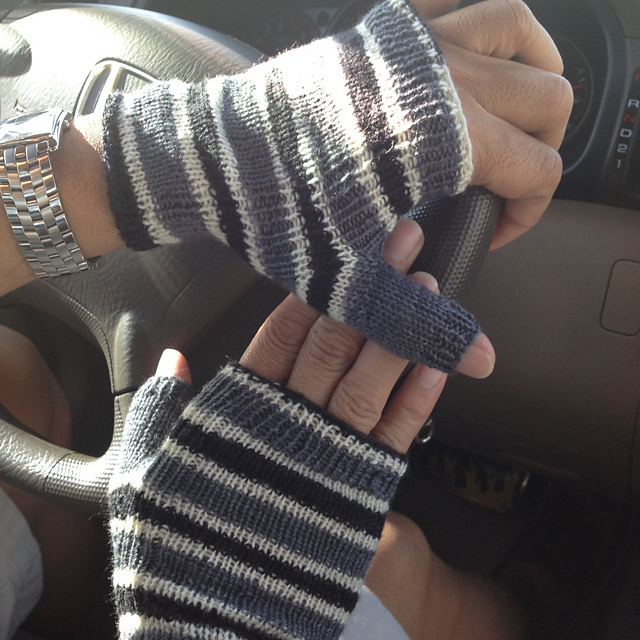 I’m talking about fingerless gloves, of course! And here are a few that I finished recently. zombie viXen is part of an Instagram Knit-Along that I discovered while browsing, well, Instagram. It is a free pattern (follow the link above), looks easy enough AND it was designed for a contest inspired by The Walking Dead, one of my favourite TV shows. What’s not to like? It features a deceptively simple cable pattern which looks elegant in any type of yarn or colourway, a gusset thumb and ribbed cuffs. I knitted mine using Sundara Yarn Sock, colourway Prickly Pear. I’ve had this skein for ages and could not find any good sock pattern to knit it with. I did use up a bit of this yarn to knit up a square for a blanket put together by a group when Sundara had her baby girl. I’m glad I was able to find the perfect pattern for the leftover. I love this pair and see at least one more in my future, maybe in STR or Bugga. Knit-Alongs seem to be a great enabler for me this year so far. 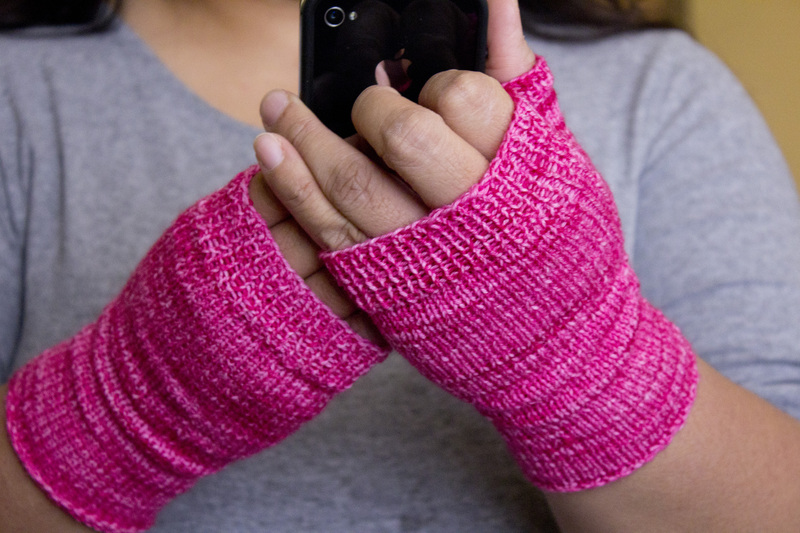 I discovered, and joined, a group on Ravelry called Fingerless Glove Fanatics. They run KALs and CALs (Crochet Along if you must know) all year round and do it on a monthly basis. 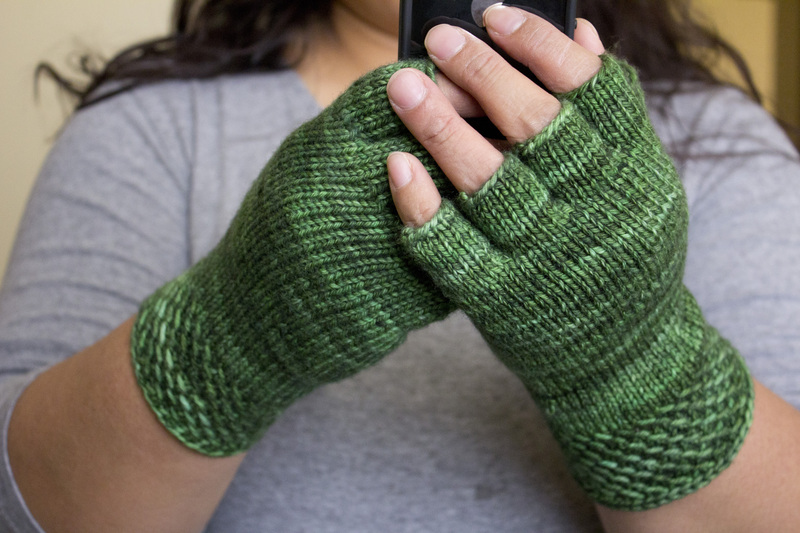 One of the two patterns for January is the Align Mitts. Simple, ribbed and stockinette, very little yarn. Why the heck not? I jumped in and used leftovers for my Alignment in Monochrome pair. So darned quick, I finished it in 3 days! Naturally, I started a second pair soon after. This time in pink! Again, using leftovers. Both Align mitts are in Yarntini. I made this second pair with a slight modification: I ribbed the first round to the end to prevent the top of the mitt from rolling; the pattern tells you to do stockinette for half the stitches and ribbed for the other half. I also made it a little longer for more coverage. I would knit this again and again. So quick and easy to make. It’s definitely one of those grab-and-go, instant gratification projects if you ever feel like it. Okay, while this pair of Knucks is not exactly fingerless, it’s still not a full glove either. I’ve had this in hibernation for ages! The first glove was finished in Feb 2011, then I took my time with the second glove, stopping in Jan 2012 just as I reached the textured cuff. And another year later, the pair is done. Yes, the fingers are fiddly and sewing in ends of worsted weight yarn without creating bulk between the fingers is a challenge, but I love how it hugs my hands and fingers. Too bad this pair is not actually for me. If I made myself a pair, I would do it with sock yarn, but not any time soon. 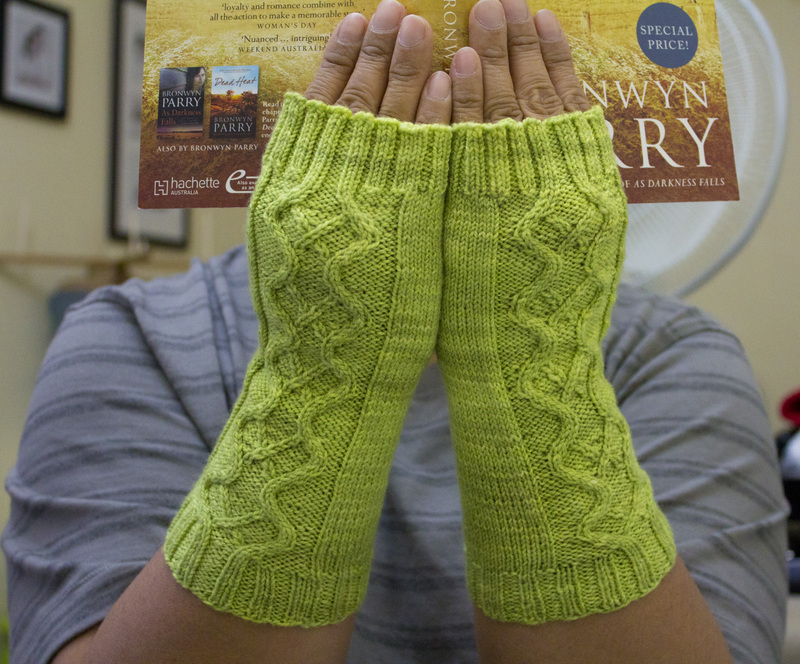 Next in the fingerless mania queue: Cotty Mittens! Yes! A fantastic lineup of fingerless mitts! I find that they are so practical to warm chilly fingers while typing (or knitting!) without having to deal with the whole glove/mitten drama!